The hotel consists of the main building and several annexes in the style of bungalows, comprising a total of 213 units. Guests are received in the air-conditioned foyer of this beach hotel with currency exchange counter, several lifts and a cosy sitting area. 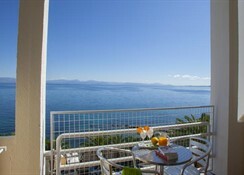 facilities on offer include a gift shop/mini market, a TV roon and lounge. 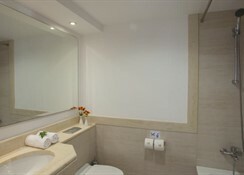 There are 2 swimming pools one with children's area, poolside snack bar, wi-fi internet access in public areas. Free loungers and parasols around the pool area. Younger guests may let off some steam in the play area or the kid's club. Guests may choose their breakfast, lunch and evening meals from buffets. Some services can have extra charge. 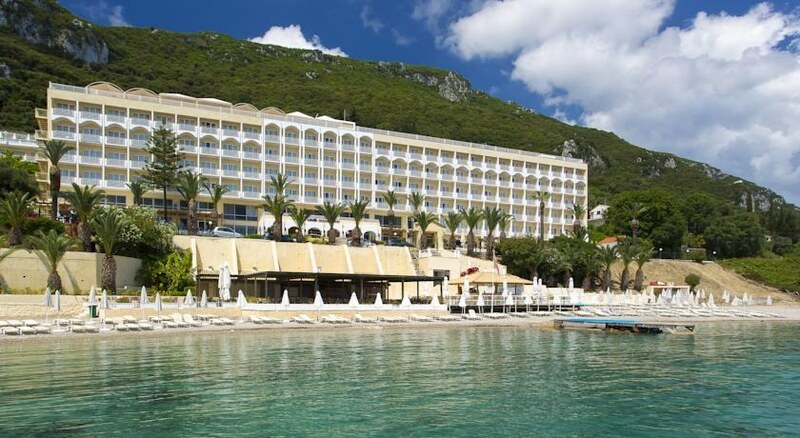 The Benitses village is only 2km from the hotel and can easily be reached by public transport where guest will find shops, restaurants, bars and enterntainment venues. The nearest public transport stop can be found on the immediate vicinity of the hotel. The tastefully appointed rooms all come with balcony or terrace, en suite bathroom with hairdryer, direct dial phone, Sat-Tv, mini-fridge, and safe (w. extra fee). Air conditioning is also provided as standard in all rooms. 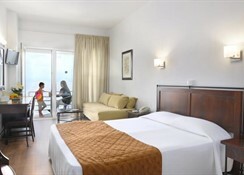 Family rooms are similar equipped but more spacious and feature sofa bed for the third/fourth person. Hotel and staff were great, clean and food and drink good quality. Not much around the hotel itself but loved the quiet location and views. Private beach was nice with safe access tunnel.